For the 2016 edition of this smartphone, see Samsung Galaxy J7 (2016). (Models SM-J710x). For the later generation of this smartphone, see Samsung Galaxy J7 (2017). (Models SM-J730x). Samsung Galaxy J7 is an Android mid-range smartphone produced by Samsung Electronics in 2015. Android 5.1.1 "Lollipop" Upgradable to Android 7.1.1 "Nougat"
J7 Core/J7 Nxt/J7 Neo Android 7 "Nougat"
1.5GB of RAM. The phone has versions 8GB or 16GB of internal storage that can be expanded with a MicroSD card up to 128GB . The cameras of Samsung Galaxy J7 is 13-megapixel primary camera and 5-megapixel front camera with LED flash. Samsung also used Super AMOLED capacitive touchscreen with high definition display for this phone. This phone is officially released with Android 5.1.1 Lollipop. Android Marshmallow 6.0.1 is available for J700F in India on 28 July 2016. Android Marshmallow 6.0.1 upgrade is also available for J700H and M in Pakistan and Panama. 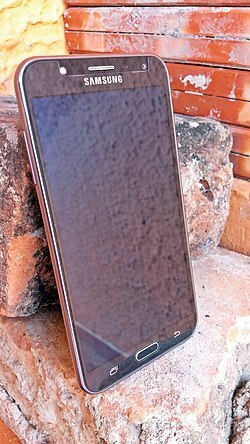 Wikimedia Commons has media related to Samsung Galaxy J7 (2015). ^ "Samsung Galaxy J7". www.gsmarena.com.